The T-Mini represents an unique choice for shops folding 100-620 items/ hour. Folding & bagging is done by one person. With a footprint of only some 12 sf, it produces a magnificent amount of folds & bags/ hr. The T-Mini is designed for startup operations, expandable into factory-style operations. Your customer will love the way you fold! Note! We have a studio machine on sale! Send us your items, we will test them for you! Simple exchanges of the folding blades are done swiftly. This way, larger or smaller items can be processed. As a standard option, the T-Mini is equipped with a gravity bagging solution allowing for multiple bag-sizes. The bags will not be sealed. Instead, an operator would peal & seal manually. Below examples of the standard bag sizes. The T-Mini could also be connected to a “push bagger” which seals, as well. In this case, the bagging unit from the T-Mini can be bypassed. The folded item will be transported to the “push bagger”, a separate person would manually push the folded item into the bag. The bagger then seals after the bag-insertion. 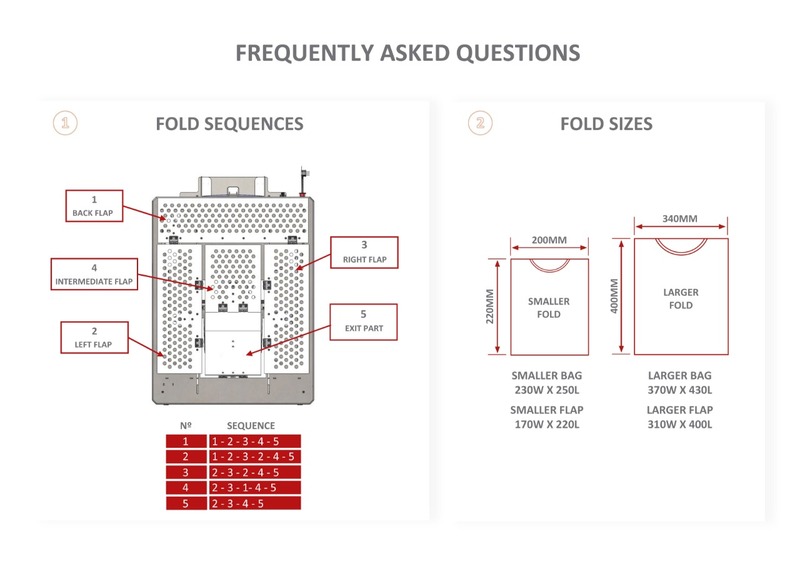 Without the conveyor system, the T-Mini requires only 12 sf of floor space to fold and bag. With that size it belongs to the smallest, fastest and most flexible option in its class. Of course, the footprint increases by incorporating a fully automated bagging system and a conveyor. At the low entry level of the T-Mini and its small footprint, some larger shops may venture the thought to have multiple T-Mini folders close to the dryers or embroiders, allowing a significant reduction in internal logistics. 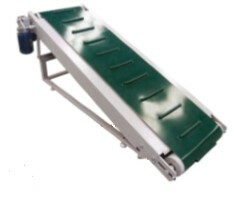 With under 700 lb in weight (without conveyor), the T-Mini can be easily maneuvered within the plant. The throughput of up to 620 folds/ hr versus its cost makes the T-Mini become one of the primary choices, when it comes to Return On Investment calculations (ROI). It’s flexibility to also automatically allow label application after the bagging process makes it attractive for further customization. All the above indicate, while being an excellent starting point for “Small Shops”, the T-Mini reaches far into the level of industrial folding as well. This means, it will grow with you into a larger organization! The T-Mini can be equipped with various labeling options. Those can be mounted either directly onto the conveyor, or they may be a stand-alone solution. For certain requirements, a cardboard insertion is necessary. A cardboard helps the product to stay nicely in its original folded form and enhances the overall appearance. Another reason a cardboard insertion can be handy is to help dry-fit materials for even improved appearance. (Note: the T-Mini does not require a cardboard to fold the dry-fit, but the appearance can be improved with it). The third reason a cardboard insertion can be of interest is, if advertising is required. The T-Mini is capable to folding items around a cardboard. This function is carried out by simply placing the cardboard on top of the item to fold. The T-Mini is built to perform on industrial level. The sturdy housing and the premium components are made to perform in multiple shifts for many years to come. When items are very heavy or very large. (That is why we always need to test the items!). Sliding the items down can distort a little at first glance, but for the most part, it automatically straightens out during the following processes. The T-Mini does not offer stacking options, at this point of time. Even though folding items up to 620/ hour is a lot, this may sometimes not be enough. Size labels cannot be applied. Label applications can only be processed after the folding or bagging. The bagger does not seal, at this time. However, a different bag with a “peal-&-seal” could utilized. If you reach any of the above limitations, you can look at our T-Apparel. It is an industrial scale folding solution which provides greater variances, more speed, more folding accuracies and multiple stacking with various exit solutions. …. no matter how many you fold, we have got you covered!! Note: When working with the T-Mini conveyor, the conveyor is hooked into the T-Mini power supply, resulting into only one drop cable for both units.